Vice News (stylized as VICE News) is Vice Media, Inc.'s current affairs channel, producing daily documentary essays and video through its website and YouTube channel. It promotes itself on its coverage of "under-reported stories". Vice News was created in December 2013 and is based in New York City, though it has bureaus worldwide. A news bureau is an office for gathering or distributing news. Similar terms are used for specialized bureaux, often to indicate geographic location or scope of coverage: a ‘Tokyo bureau’ refers to a given news operation's office in Tokyo; 'foreign bureau' is a generic term for a news office set up in a country other than the primary operations center; a ‘Washington bureau’ is an office, typically located in Washington, D.C., that covers news related to national politics in the United States. The person in charge of a news bureau is often called the bureau chief. Bloomberg Businessweek is an American weekly business magazine published since 2009 by Bloomberg L.P. Businessweek, founded in 1929, aimed to provide information and interpretation about events in the business world. The magazine is headquartered in New York City. Megan Murphy served as editor from November 2016; she stepped down from the role in January 2018 and Joel Weber was appointed in her place. The magazine is published 47 times a year. The Guardian Weekly is an internationally focused English-language news magazine based in London, UK. It is one of the world's oldest international news publications and has readers in more than 170 countries. Editorial content is drawn from its sister publications, the British daily newspaper The Guardian and Sunday newspaper The Observer, and all three are published and owned by the Guardian Media Group. Prime Video is an Internet video on demand service that is developed, owned, and operated by Amazon. It offers television shows and films for rent or purchase and Prime Video, a selection of Amazon Studios original content and licensed acquisitions included in the Amazon's Prime subscription. In the UK, US, Germany, and Austria, access to Prime Video is also available through a video-only membership, which does not require a full Prime subscription. In countries like France and Italy, Rent or Buy and Prime Video are not available on the Amazon website and Prime Video content is only accessible through a dedicated website. In some countries Amazon Video additionally offers Amazon Channels, which allows viewers to subscribe to other suppliers' content, including HBO in the United States. Impact, styled also as Impact with Yalda Hakim is a news programme that premiered on BBC World News on 1 February 2010 as part of a network-wide refresh. The programme is hosted by Yalda Hakim, who replaced previous presenter Mishal Husain. The programme brings audiences a mixture of breaking news, debate and analysis using the BBC's range of correspondents based in the Asia Pacific regions and across the world. Broadcasting political, diplomatic, business, sports and breaking news stories directly affecting Asia Pacific, the programme aims to analyse stories from a global perspective. The format includes sport, business and weather updates. David Abraham is a British media executive, who is the ex-chief executive of Channel 4 Television Corporation. In 1997 he co-founded the creative agency St. Luke’s. Abraham then went on to senior creative roles at Discovery Communications in the UK and the US before becoming CEO of UKTV in 2007 and then CEO of Channel 4 from 2010 to 2017. Viceland is a multinational brand of television channel owned by Vice Media, which also provides programming. Viceland launched on February 29, 2016 with two Viceland-branded cable channels; the American version is a joint venture majority-owned by A&E Networks, while the now defunct Canadian version operated as a Category A-licensed specialty channel majority-owned by Rogers Media. Louis John Cole, better known by his online alias FunForLouis, is an English film-maker and YouTube personality from Epsom, Surrey. He has a following of over 2 million on YouTube and is best known for posting a daily video blog on the channel FunForLouis, which documents his life and travels adventuring all over the globe. Cole originally found fame through filming eating stunts on another channel, FoodForLouis, but has since taken these videos down to focus on the positive message of FunForLouis. Shane Smith is a Canadian journalist and media executive. He is the co-founder and Executive Chairman of the international media company Vice Media, operating an international network of digital channels, a television production studio, a record label, an in-house creative services agency, a book-publishing house, and a feature film division. Smith served as CEO of Vice from its founding until March 2018. Former A+E Networks CEO Nancy Dubuc was named CEO March 13, 2018. In his role as Executive Chairman, "Smith will now be focused on creating content and strategic deals and partnerships to help grow the company." London Live is a local television channel in London, England. The channel transmits local news, current affairs, sports, arts, events and entertainment. It is part of Ofcom's rollout of local television channels throughout the UK. Vice is a documentary TV series created and hosted by Shane Smith of Vice magazine. Produced by Bill Maher, it uses CNN journalist Fareed Zakaria as a consultant, and covers topics using an immersionist style of documentary filmmaking. It premiered on April 5, 2013, on HBO. The show's second season aired in 2014 and won an Emmy Award for Outstanding Informational Series or Special. Copa90 is a football media business. Past credits of the company include the UK web drama Kate Modern, which is a spin off of the American web series called lonelygirl15. The company is also known for the interactive mobile game I AM PLAYR and Sky 1 and NBC comedy drama You, Me and the Apocalypse. Jenny Naomi Kleeman is a British documentary film-maker and journalist who is best known for her work on Channel 4's foreign affairs series Unreported World and BBC One's Panorama. Reuters TV is a mobile video news service operated by the news organization Reuters. The service is available via several digital media players as well as the Reuters and Reuters TV apps and the Reuters TV website. Live feeds from service were also available via Livestation before Livestation was shut down. Turkey's media purge after the failed coup d'état on July 15, 2016 resulted in the shutdown of at least 131 media outlets and the arrest of 117 journalists – at least 35 of whom have been indicted for "membership in a terror group". Nichi Hodgson is a British journalist, broadcaster, and author. She was one of the first British journalists to court-report via Twitter, covering the 2012 obscenity trial, R v Peacock. Alison Phillips is a British journalist and the Editor of the Daily Mirror since 2018. ↑ "About Us". Vice News. Archived from the original on 2014-07-03. Retrieved 2014-07-11. ↑ Dumenco, Simon (March 4, 2014). "Vice News Is Seriously Very Serious (SRSLY)". Advertising Age . Retrieved 2016-08-01. ↑ Bercovici, Jeff (March 4, 2014). "Vice News Launches, Promising 'Changing Of The Guard In Media'". Forbes. Retrieved 2016-08-01. ↑ Byers, Dylan (February 26, 2014). "Vice News, where video works". Politico . Retrieved 2016-08-01. ↑ Mosbergen, Dominique (October 17, 2014). "Vice News To Expand Globally". The Huffington Post . Retrieved 2016-08-01. ↑ Sweney, Mark (October 17, 2014). "Vice Media expands news channel to seven new countries". The Guardian . ISSN 0261-3077 . Retrieved 2016-08-01. ↑ Atkinson, Claire (October 14, 2015). "Tyrangiel officially joins Vice to head up HBO show". New York Post . Retrieved 2016-08-01. ↑ Grove, Lloyd (October 2, 2015). "Why Bloomberg's Top Editor Quit—and Why It Shows Mike Bloomberg Is Back in Charge". The Daily Beast . Retrieved 2016-08-01. ↑ Sterne, Peter (April 18, 2016). "Vice News names Ryan McCarthy editor in chief". Politico. Retrieved 2018-02-13. 1 2 Quinn, Ben; Jackson, Jasper (May 24, 2016). "Vice Media lays off 20 staff in restructuring plans". The Guardian. ISSN 0261-3077 . Retrieved 2016-08-01. ↑ Valinsky, Jordan (May 20, 2016). "Vice's Shane Smith: 'Expect a bloodbath' in media within the next year - Digiday". Digiday . Retrieved 2016-08-01. ↑ Spangler, Todd (June 1, 2016). "Vice News Touts New Hires in Staff Reshuffle Under Josh Tyrangiel". Variety. Retrieved 2016-08-01. ↑ Sweney, Mark (December 8, 2016). "Guardian announces partnership with Vice". theguardian.com . The Guardian . Retrieved December 8, 2016. ↑ Ellis, Justin (January 7, 2014). "Vice News wants to take documentary-style storytelling to hot spots around the globe". NiemanLab. Retrieved 2016-08-01. ↑ Elgot, Jessica (April 22, 2014). "Vice Reporter 'Kidnapped' In Ukraine". The Huffington Post. Retrieved 2016-08-01. ↑ Calderone, Michael (April 24, 2014). "Vice Correspondent Released In Ukraine". The Huffington Post. Retrieved 2016-08-01. ↑ Launder, William (November 12, 2013). "Vice Media Bulks Up News Division". Wall Street Journal. ISSN 0099-9660 . Retrieved 2016-08-01. ↑ "VICE on City". CityTV. Archived from the original on 2015-07-05. Retrieved 2016-08-01. ↑ Sweney, Mark (August 23, 2014). "Vice News sparks debate on engaging younger viewers". The Guardian. ISSN 0261-3077 . Retrieved 2016-08-01. 1 2 Goldner, Tracey (September 25, 2014). 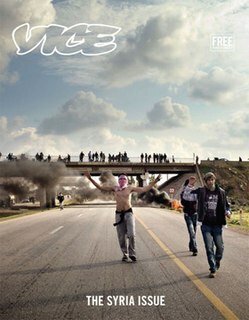 "Vice News thrives with young audience, controversy - Global Journalist". Global Journalist. Retrieved 2016-08-01. ↑ "Vice News thrives with young audience, controversy - Global Journalist". Global Journalist. 2014-09-25. Retrieved 2018-04-25. ↑ Swaine, Jon (March 2, 2014). "Vice's Shane Smith: 'Young people are angry and leaving TV in droves'". The Guardian. ISSN 0261-3077 . Retrieved 2016-08-01. ↑ Mojica, Jason (20 April 2015). "VICE News Wins Two Peabody Awards". VICE News. Retrieved 30 June 2018.